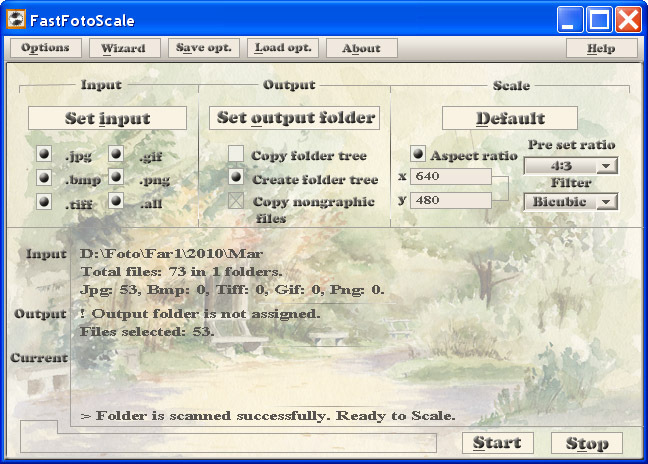 FastFotoScale is a batch picture processor for: resizing, renaming, creating WEB/PC/virtual albums, viewing with date/time/metadata/geo coordinates navigation, organizing thousands images, creating stereo photos. FastFotoScale performs cropping, fitting, stretching, converting, editing EXIF, filtering, sorting, duplicates finding, creating audio annotations, private pictures creating and viewing too. It is the best way to organize/process thousands pictures at once. ...... the reference dimension rectangle without cropping, ? ?reating a database of photos. * Smart Folder mode allows to create or rebuild folders tree with photos based on information contained in EXIF tags. FastFotoScale supports audio annotations and GPS GEO coordinates in view, edit and WEB/PC albums modes. * FastFotoScale allows to organize images by filtering Exif tags with logical OR, AND, NOT operations. * Stereo mode allows to make stereo pictures in various formats: color anaglyph, gray anaglyph, side-by-side, cross-eye. * Multistep Wizard makes setup simple and understandable. * Explorer-like metadata viewer and Drag&Drop editor let you work with photos quickly and easily. * FastFotoScale has special Step By Step mode which gives possibility to set individual dataa�?s for each picture. FLV tools gallery for users to enjoy Christmas video better, 4 tools included. Qweas is providing links to FastFotoScale 3.50 as a courtesy, and makes no representations regarding FastFotoScale or any other applications or any information related thereto. Any questions, complaints or claims regarding this application FastFotoScale 3.50 must be directed to the appropriate software vendor. You may click the publisher link of FastFotoScale on the top of this page to get more details about the vendor.